The Official RuneScape Forums are a place where tons of players discuss updates, make suggestions, trade, and much more. Thousands of threads are posted everyday, and hundreds are locked for breaking the forum Code of Conduct. Being able to make sure that your thread abides all of the rules is one of your keys to forum success. Getting around these forums can be tough for beginners, but eventually you will get the hang of it. You can access the Official RuneScape Forums by clicking on its link on the RuneScape Homepage. It is under the web site features section. 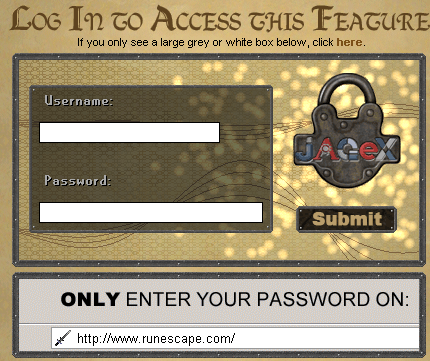 If you are a subscriber to the members' version of RuneScape, you will automatically have a forum account. You can log in by clicking the link in the upper right-hand corner of the forums' home page. Once you have finished entering your username and password, you will be directed to a page where you must agree to the terms and conditions of the RuneScape Forums. Remember to read them on your first visit. After you are securely logged in, you will be given the option to go to your profile. Punishment for not following the Code of Conduct can result in your thread being locked or removed. If your offense is more serious, you can be suspended or banned instantly from the forums. Jagex has a three strike policy on the forums. If something you have posted was removed, you will receive a message in your message center informing you that you have received a strike. If this happens three times, you will be banned from the official forums and will have to go elsewhere. If you have received a mute or ban in-game, you will not be able to post on the forums. If you have been banned or suspended from the forums, you will not be able post on the forums but you will still be able to use the in-game chat box to communicate with other players. To learn more about Jagex and Forum Moderators, please see the RuneScape Moderators guide. A Freeplayer with an Overall skill level of at least 500. To edit your post after creating it, simply click the "Edit" button on the left side of the box. Copy/paste the numbers into the "Jump to Thread" box directly right of the search button and click go. You will be directed to the thread that the number belongs to. It is very hard to remember these numbers, so copy/paste them into a word processing program if you want to remember them. There are some symbols on the forums that you will need to know about in order to understand everything. Below is your guide to these symbols. Sticky - If a thread has this symbol next to it, it has been placed at the top of the forum by a Jagex moderator and will remain there unless it is un-stickied. Locked - No one besides a moderator will have the ability to post on this thread unless it is unlocked by a moderator. Threads are usually locked when it breaks the forum rules. Forum Specific Rules - You will find this symbol at the top of every category in the forums. Click the link next to it to find the Forum Specific Rules. A hidden thread - This is what a hidden thread will look like. Code of Conduct - You will find the link to the forum Code of Conduct next to this symbol. The forums are a fantastic place to communicate with other players, but can be a nuisance because of their high levels of spam and inappropriate topics. You can do your part in making the forums a better place by following the rules and teaching them to others. Enjoy the forums, but use them responsibly.